Home » Projects & Issues » Local Issues and Information » Buffers Can Protect Sussex County’s homes, businesses, and environment! 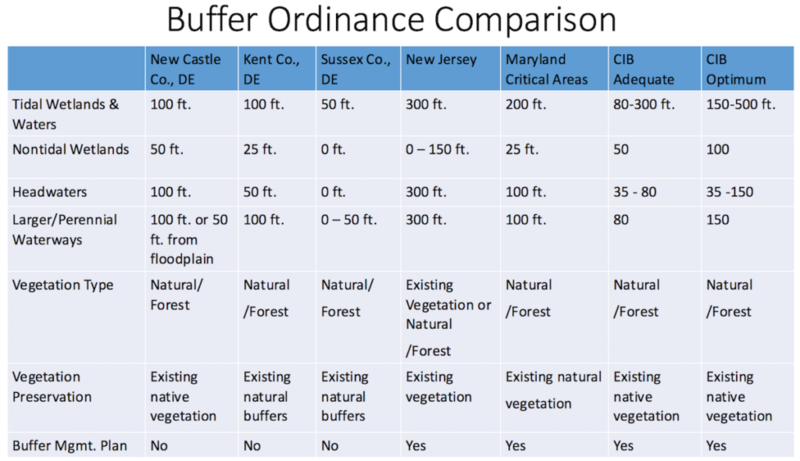 Buffers Can Protect Sussex County’s homes, businesses, and environment! But the County must hear from YOU in order to take advantage of these opportunities. Check out the resources below for information and to find out how you can help protect Sussex County. A nice example of a forested buffer implemented along Love Creek. The County is also now considering new rules that would require more vegetated space between waterways and construction. Currently, Sussex County only requires a 50-foot buffer on tidal wetlands and waterways: only half the distance that is required in Kent and New Castle counties, a quarter of what is required in Maryland and only one-sixth of what is required New Jersey. Sussex County’s current buffer ordinance must be improved to better protect our most sensitive wetlands and waterways, prevent intensified flooding and erosion, and reduce pollution. 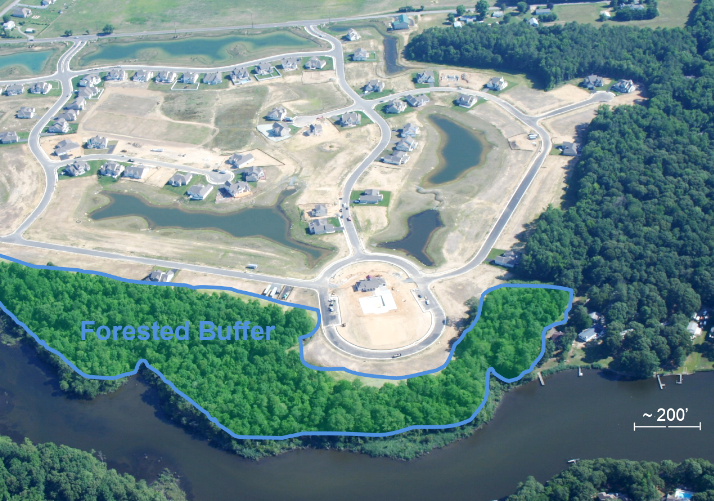 Other counties in Delaware, and the states of Maryland and New Jersey are excellent examples of how more extensive buffers are implemented successfully and have benefited the surrounding communities. West Complex 22215 DuPont Blvd., Georgetown DE. *Public may attend but no public comment period will be observed. 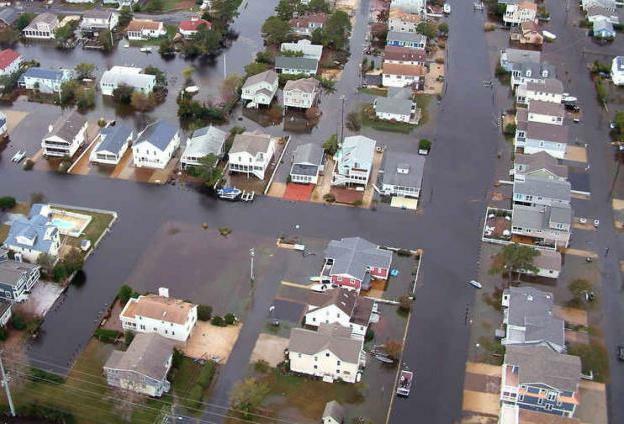 A flooded view of Fenwick Island just after Hurricane Sandy in 2012. SUCCESS: This ordinance has passed! The Delaware Center for the Inland Bays would like to thank the Sussex County Council and the supporters that advocated for this ordinance, as well as Councilman Burton for his dedication to protecting our County’s environment. Details are available in the meeting information and audio (120418.2.mp3) for the December 4th County Council Meeting, available on the County Website. Until now, the County has allowed for high housing density in developments that include unbuildable areas, like wetlands! This concentrates homes in developments near sensitive wetlands and waterways, which degrades our natural resources, adds more impervious surfaces (and stormwater runoff) close to our waterways, and escalates the risk of flooding homes and businesses. The new ordinance would reduce these effects by subtracting wetlands from the “gross” buildable area. This would reduce the number of homes permitted on areas near high concentrations of wetlands and protect water quality (wetlands act as water filters), preserve natural habitats, and help prevent flooding (wetlands also act as sponges for floodwaters)! Planning & Zoning Commission Public Hearing on 9/13/18 at 6:00 p.m.
County Council Public Hearing on 10/9/18 at 10:00 a.m.